We’re on a quest to bring you the UK’s best farm-stays for all the family. This collection of luxury rural retreats as recommended by Baby Friendly Boltholes are guaranteed to bring Old Macdonald to life, to the delight of your children. Chittlehampton Farm is the place to head if you’re looking for a luxurious getaway to experience real-life on a farm. Situated a short drive from the M5 on the beautiful north Devon coast, the farm is home to a whole host of brilliant facilities and four-legged friends to interact with. Little ones will have the time of their life playing in the heated outdoor pool, enjoying the ride-ons, trampoline and adventure play area complete with mud kitchen! Located in the rural countryside of Carmarthenshire, this is a fantastic location for families looking to get stuck in to farm life during their stay. 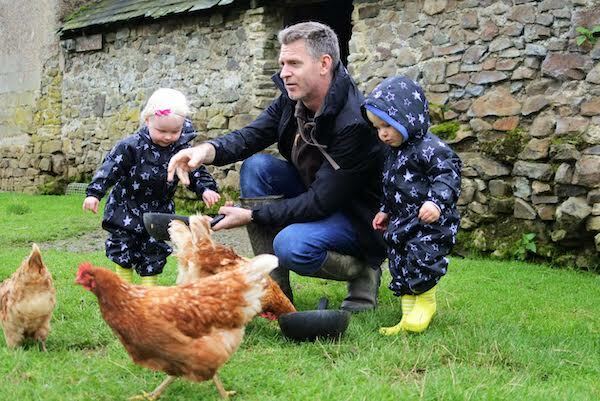 In the springtime children can get involved in mucking out, lambing, handling baby chicks, walking the goats and collecting fresh eggs for their breakfast. There are ‘Junior Farm Days’ for older children aged 5-12, where kids can spend the entire day experiencing the life of a farmer. They’ll be no time for little ones to get bored with the on-site facilities available. There’s a climbing fort, castle on the hill, swings, sides, trampolines, sand-pits, ride-on tractors and diggers. The cottages on Cwmcrwth Farm are located just 25-minutes from gorgeous dune backed sandy beaches and rock pools for little explorers to enjoy. Clydey Cottages is located in grounds spilling out across 20 acres in the unspoilt North Pembrokeshire Coastal National Park. 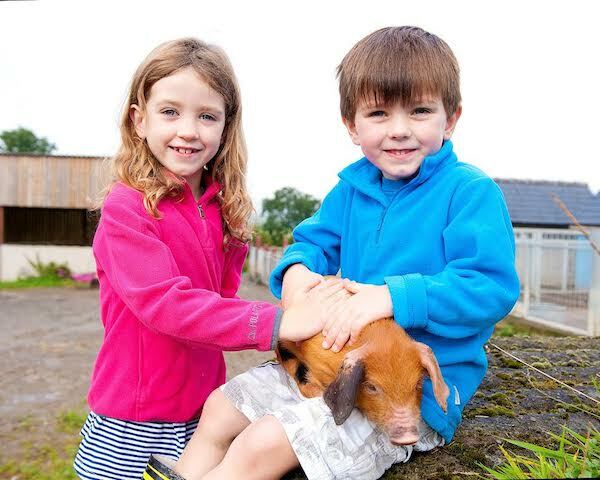 Children will love getting stuck in on the farm with daily animal feeding and egg collecting. There’s an indoor playroom complete with soft place facilities for rainy days, and during school holidays kids can enjoy regular circus skills and woodland adventure sessions. Guests can enjoy making use of the complimentary creche and kids club, as well as enjoying the indoor and outdoor hot tubs, swimming pool and spa. Tapnell Farm is a popular attraction on the Isle of Wight boasting its own farm park, adventure playgrounds, soft play, restaurant and farm shop, alongside child-friendly cottage and luxury glamping tents. The latter come with several bedrooms, electricity, log burners and hot tubs! 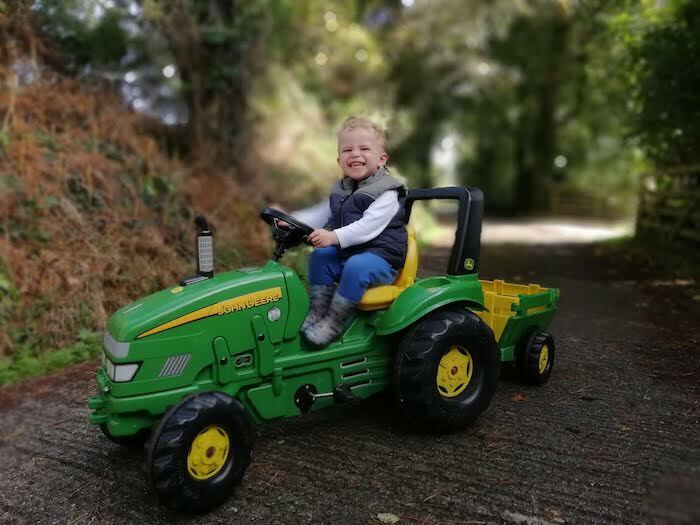 From feeding the animals, collecting eggs, exploring the play barn and having fun on the bouncy pillow, they’ll treasure the time spent in the great outdoors. With the beach nearby full of rock pools and stunning coastal paths there really is no end of things to do. These eight baby and toddler friendly cottages are both country and contemporary in style, based within the secluded countryside of Cornwall. 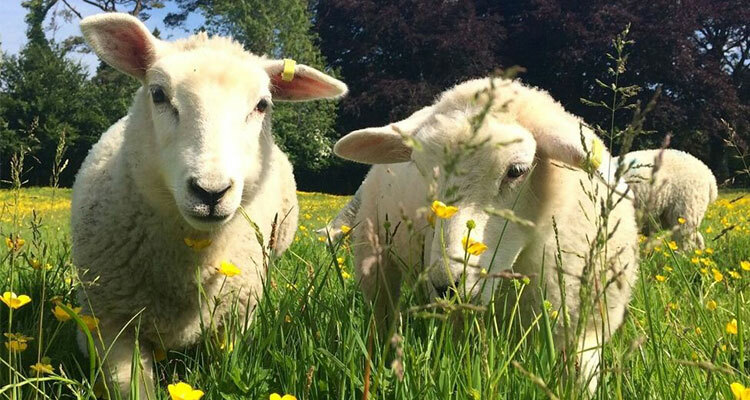 Children are encouraged to indulge in a slice of country life, helping lambs to bottle feed, feeding and handling baby animals, collecting eggs, as well as organised pony rides on hand. If the weather turns, there’s plenty to do indoors to keep the kids amused. Each cottage is based within a short walk to the the indoor pool, soft play, play park, sandpit, and games room with table tennis and a pool table. There’s a whole host of accommodation on offer at Drovers Rest. 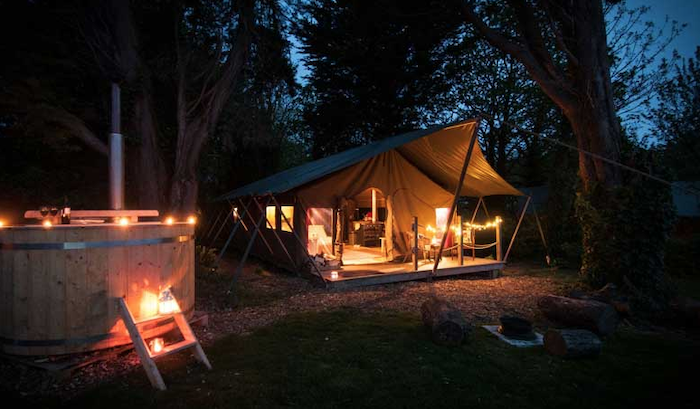 Families can choose from cottages or luxury glamping tents for a real outdoor experience. Located in the foothills of the black mountains near Brecon Beacons National Park, Drovers Rest is a fantastic option for a hands-on farm-stay. 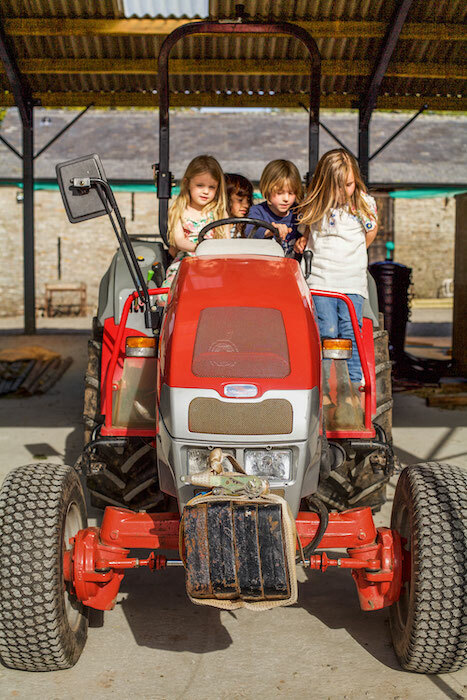 Children will spend their days helping out on the farm, with new seasonal activities planned every week – from egg collecting to animal feeding. They can even try their hand at supervised pony rides! The wider area is home to two local soft play barns and a miniature train centre that kids will adore. 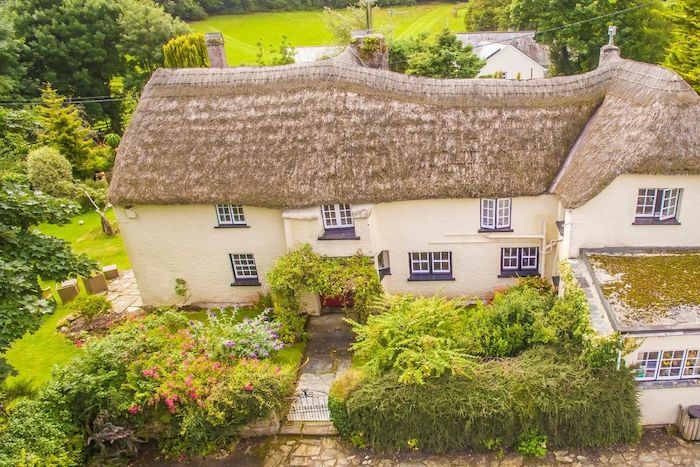 There are six detached cottages available for hire at Cornwall’s Trelowth, scattered charmingly within 30 acres of meadow and woodland. With excellent onsite facilities including an indoor pool, tennis courts, games room, an indoor play barn and a playground specifically for toddlers, there’s so much for all ages to do. 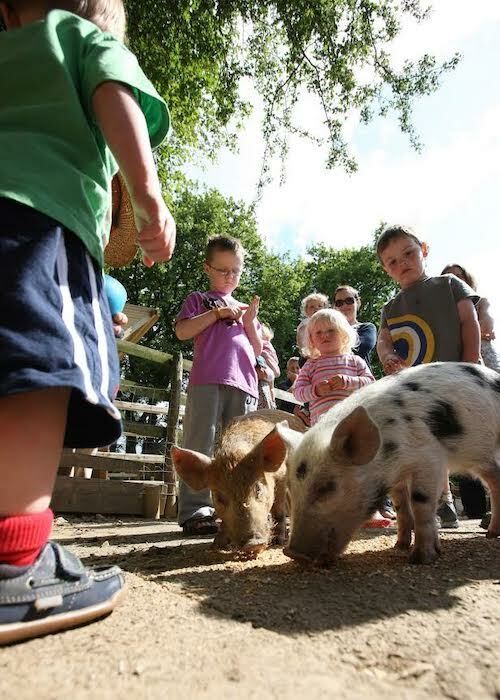 As well as helping out on the farm with animal feeds and egg collecting, families can enjoy a wild animal trail through the woodlands, discovering statues and prizes along the way. Set within 13 acres of beautiful Cornish countryside there are eight family friendly cottages specifically designed for families with little ones. Children are encouraged to join in on farm rounds and there’s lots more to do besides. Experience everything there is on offer, from an indoor heated pool, playroom, playground and soft play area. Embark on a local forest trek through scenic woodland or explore the beautiful beaches just short drive away. For any adults wanting a bit of a break from the kids, there’s even a babysitting service on hand. A fabulous 5 star choice of farm-stay, this boutique range of east Devonshire cottages and accompanying facilities make for the perfect family-friendly stay. There’s stacks to do, from a heated indoor pool, games room, play room and play barn and play area home to a wooden fort, climbing frame, slides, see-saws and ride-ons. Red Doors Farm has catered perfectly for every age. Children will love interacting with the farm’s resident chickens, ducks, pygmy goats and guinea pigs. The countryside-by-sea location means there’s no shortage of things to do off-site too. Take a trip to one of the local beaches and explore the smugglers’ coves, or roam free in the miles of idyllic countryside. If glamping’s your thing, this is the Farm-Stay for you. 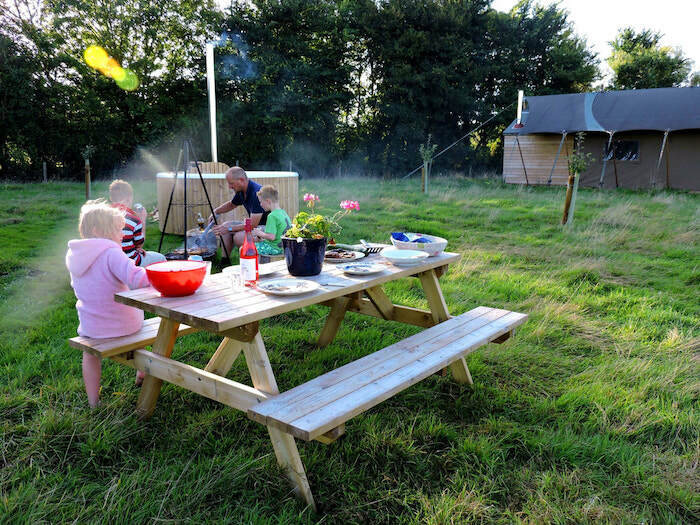 Stay in one of three amazing safari lodges at Middle Stone Farm in Somerset and enjoy a wood fired hot tub, swing ball, picnic table and barbecue, perfect for those occasional warm spring evenings. 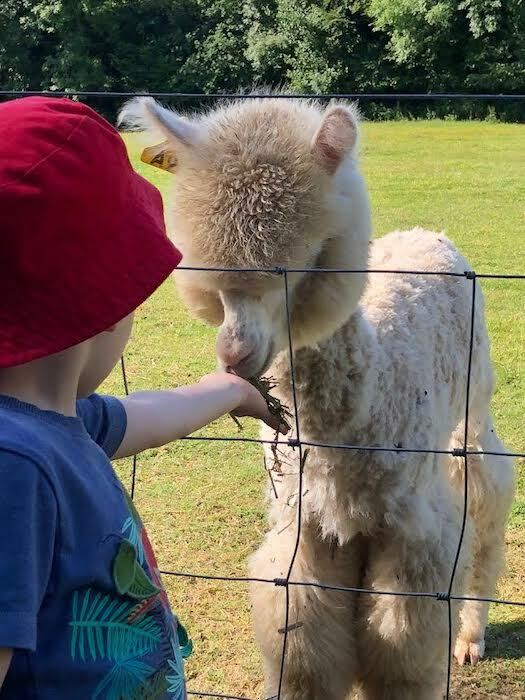 Children will enjoy living amongst free-range chickens, and will love meeting the gaggle of alpacas, rare breed sheet, pigs, Welsh ponies geese, dogs and tortoises – all in residence at Middle Stone Farm. If glamping/camping sounds a little too adventurous, fear not, you can opt for one of the two holiday cottages available on site. 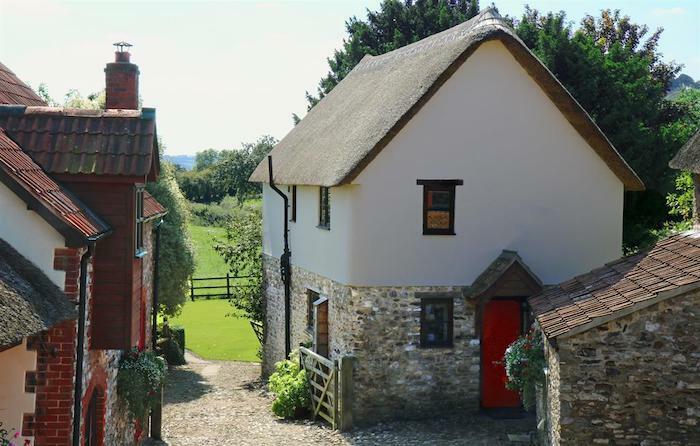 Based just outside the little village of Brompton Ralph in West Somerset, families can enjoy the Somerset countryside and local Exmoor National Park. Nearby beach Blue Anchor Bay is perfect for exploring rock pools if the weather is fine.